Although River North is considered to be a prosperous area, there are many living among us who do not share that prosperity. Some of them are homeless and live under viaducts or in the entrance ways to vacant buildings. This past year we formalized the Assumption Shares / Food Coupons ministry. Each and every Wednesday we distribute $5.00 Chicago Shares coupons to anyone who comes to the rectory between 11:30 and 12:00 noon. These coupons can be redeemed for food at Jewel and at several sandwich shops in our area. A representative of this ministry spoke at each Mass last weekend about the need for increased funding for Assumption Shares. That is because this ministry has grown tremendously over this past year. 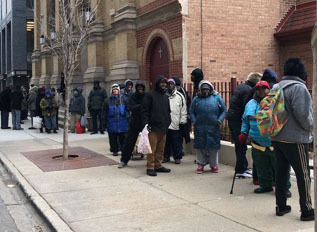 We give out coupons to about 70 people each Wednesday and have had as many as 90, some standing on line for hours in the cold waiting for us to begin. We do not try to validate their need. We believe that God has brought them to us for help and we give it. We turn no one away. This program now costs us $20,000 a year and could become more expensive if the weekly number grows. We take up a collection each quarter for this ministry, and we have a fundraiser coming up at the end of January, but the proceeds fall far short of covering our expenses. So, I am asking those of you who are able to consider making a New Year’s Resolution: to sponsor or co-sponsor Assumption Shares for at least one week this coming year. $400 would cover one week’s expenses and $200 would cover half the cost. You can put an envelope in the collection marked Assumption Shares, mail a check to the rectory, or contribute on line through Give Central. Go to www.assumption-chgo.org and under “Quick Links” select “Electronic Giving”. Perhaps instead of making a large gift, you can commit to making a monthly gift of $20 or $25 in 2019. Remember, if you donate via GiveCentral, your Assumption Shares donations will track separately from your regular church offerings. Keep in mind that everything that you give goes directly to the poor. There is no overhead with this program. If you are aware of or have access to a private foundation that awards grants for these types of programs, please let us know. We are interested in applying for this type of funding. May God continue to bless you in this New Year.